The streets of New York City come alive on the first Sunday in November when it hosts the annual marathon. The New York City Marathon allows more than 52,000 runners to cruise 26.2 miles in the greatest city in the world. Given that it's one of the most prestigious marathons, arguably the most prestigious, more than two million people like to watch the festivities as well. The event provides the perfect excuse for folks to travel to New York or for locals to see something take place on the streets that doesn't normally occur. Many parties are centered around the event, either in people's apartments, in bars, or in restaurants along the route. As with anything else, there are plenty of tips for experiencing the race as a participant or as a spectator. Here are some things you'll need to know for both. Getting to New York is easy but not necessarily inexpensive. The cheapest way to travel is by car, with New York being less than a two-hour drive from Philadelphia, three hours from Baltimore, and less than four hours from Boston and Washington, D.C. You can also get there by train with Amtrak from those same four cities very easily. Routes also run down the east coast and extend as far as Chicago, New Orleans, Miami, and Toronto. Flying into New York is easy because of the three airports in proximity. United is the primary airline operating into Newark with Delta dominating routes into LaGuardia and John F. Kennedy, but other airlines offer flights as well. The easiest way to look for flight is with the travel aggregator Kayak or Hipmunk unless you specifically know what airline you want to travel on. Hotel rooms in New York City are as expensive as any city in the world, and they're at their most expensive during the fall, so don't expect to catch a break on pricing. Most people will end up staying in Midtown because that's the area populated with the most hotels and it’s not far from the finish line, but there are plenty of nice neighborhoods with hotels. There are numerous brand-name hotels in and around Times Square, but you might be best served not staying in such a highly-trafficked location. Wherever you stay, you can use Kayak or Hipmunk again to help with your hotels. Anthony Travel is the official travel partner of the New York City Marathon and offers extra perks to those booking travel through the company for marathon weekend. You're not that bad off as long as you're within a subway ride to where you need to go. Roomer is a nice alternative for booking hotels as it acts as a secondary market for hotel rooms. Unused rooms are posted on the site and sold at discounts by people looking not to lose their money on non-refundable hotel reservations they won’t be able to fulfill. There are likely runners who booked reservations, but injuries prevented them from needing to use the room. Alternatively, you can look into renting an apartment via Airbnb or VRBO. There’s a lot of focus on diet leading up to a marathon, and New York’s restaurant scene is as good as any in the country. Unfortunately, you’ll probably have to be specific about your intake before the race and can save the more diverse items for afterward. Italian food is one favorite choice as people look to “carbo-load” before a race, and no American city can match New York on its Italian food. Finding a restaurant reservation might be tough as people plan well in advance for their night-before dinner. Open Table is always the best way to book reservations as most restaurants are listed on there. Those that don't generally have different online reservations systems on their own website or can be booked over the phone. Restaurants do this to pay fewer in fees to Open Table on bookings. 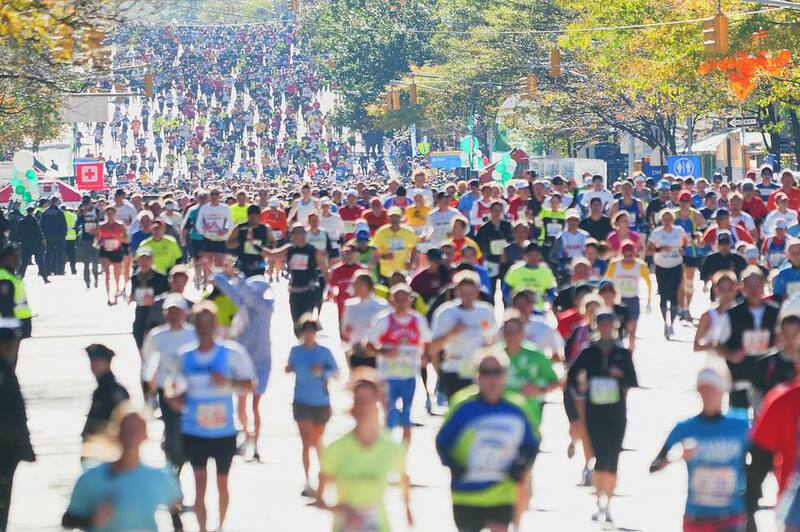 New York Road Runners decided to create a new 25,000-foot pavilion for the 2015 marathon. The pavilion is open starting on the Monday before the race until the Monday after the race. It has a snack bar with food from the chefs at Tavern on the Green, which is a shop selling marathon gear and offering running-related programming. The main stage hosts book signings, film screenings, celebrity appearances, and other events. The whole pavilion is open almost every day with Sunday being limited to ticket guests and Saturday being closed off for private events. Runners are generally advised to stay off their feet on the days leading up to the race and there are plenty of ways in New York to do that. Madison Square Garden, Barclays Center, and Prudential Center are all easily reachable by walking or by public transportation and can offer a sports or concert fix. You can also catch a Broadway show, see a movie, go to a comedy club, or find a number of other things to do. Just save the museums for another time since you don’t want to be walking around them when you’re supposed to be staying off your feet. Make sure you know the marathon route before you figure out where you’re going to be. It provides subway stops so you have help getting around and avoiding the traffic. Dress warmly. You don't realize how cold it is standing around doing nothing until you do it. Use the mobile app to track the specific runner. That way you can know when you will see the runner or runners you’re cheering on. Fourth Avenue in Brooklyn as well as on First Avenue from 60th to 90th Street are great places to watch the race with numerous bars having marathon-related specials. If you're in Queens, you should gather after the Pulaski Bridge on Vernon Boulevard since that's where runners begin the second half of the race. The most crowded place in Manhattan to watch is where runners come down the Ed Koch Queensboro Bridge on 59th Street and First Avenue. It’s the southernmost place the marathon goes in Manhattan, so many people walk up to see the action. The corner of 59th Street at Central Park South is busy for the same reason. Crossing First Avenue during the race is a nightmare, so don’t even try it. You have to go down to 57th Street to do it in a vehicle. You can listen to salsa music and experience a Puerto Rican vibe at Mile 19 on First Avenue near 117th Street. You’ll have great views of the winners for photos and can help those runners move along as they start to hit the wall. Enter the park near 68th Street on Fifth Avenue, and walk over to the running route. You’ll be 1.5 miles from the finish line so people need your support. Many people urinate off the side of the Verrazano-Narrows Bridge where the race begins, so make sure you’re not standing near the edges if you’re on the bottom level. It's even worse if it’s windy. There are also plenty of other places off to the side of the route to urinate in the first few miles. Women should remember to bring tissues or toilet paper to go to the bathroom before the race. Portable toilets are generally where women are forced to go throughout the race, and they might be frightening inside. By the end of the race, most runners are urinating in their pants anyway. Do your best to keep at your pace when the race starts. People tend to let the adrenaline take over and start too fast. Hydrate as much as possible, before and during the race. The last thing you want is to be dehydrated when you’re pounding out 26.2 miles. Squeeze the cup at the top when you grab it at a hydration station. It keeps the liquid in the cup better and it’s easier to drink. The Ed Koch Queensboro Bridge will not be fun. It’s uphill to start and there are no hydrating stations. The Bronx will be tough because it has fewer people cheering you on than any other area. All the adrenaline kicks in once you get to Central Park. It’s smooth sailing from here on out. If you have friends or family waiting for you to help you walk afterward, they’ll need to meet you north of Tavern on the Green in Central Park. You’ll need at least 15 minutes to find them since things get a little hectic once you cross the finish line. The further you go away from the finish line, the easier it is to meet friends.